This series has all those wonderfully overused shoujo-manga cliches all over it, but, as usual, I just can’t resist it. Those manga authors know my weakness and deliberately tempt me, I swear! This story features love triangles, secret identities, and idol stars. What more can you possibly ask for? ^_^;; Lets see.. It is the story of a super cute high school girl named FUJIKAWA Mitsuki. She is short and adorable, but is always mistaken for a middle school student. This is really annoying! Then one day at school, she is forced by a teacher to help out a HIROSAKI Atsuki, a rather popular boy at her school. He is the same age as Mitsuki, but in a different class. He is really smart and popular. He also acts really weird after meeting her, staring at her with great intensity. He can see the true beauty in her. 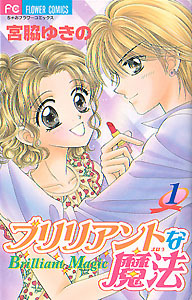 This being the world of shoujo manga, Atsuki happens to secretly be a super-genius make-up artist and fashion guru. He either owns, or works at a high-class boutique in the fashion district. (Quite industrious for a high school boy!) Atsuki wants Mitsuki to become the shop’s image model girl. Using his amazing make-up artist skills, some nice clothes, and a wig, he transforms Mitsuki into a stunning beauty. Everyone is amazed by how beautiful she is. While walking on the street, heads turn and marvel at her. She gets five or six offers from talent scouts to become a model for their agencies. Oh yes, I mentioned that this story has a love triangle? Where here it comes… while wandering around, enjoying the experience of looking her age and being pretty, Mitsuki encounters another cute boy. His name is MASHIMA Kyo, and he is a famous teen idol. He is instantly smitten with her, and does something to Mitsuki that results in some interesting publicity! Mitsuki really likes this idol boy, but he only knows her as a stunning beauty, not her real, just-cute self. Would he really like her if he saw her as she really was? And what about Atsuki? He could see the beauty in her, and seems to be interested too. Romantic hijinks ensue!